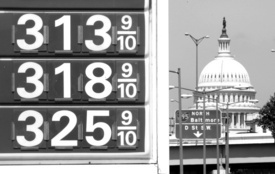 WASHINGTON — Hustling to contain voter outrage over gas prices ratcheting up over $3 a gallon in an election year, President George W. Bush ordered the Justice Department to investigate price fixing. He also suspended environmental rules to allow Big Oil to sell polluting gasoline. Oil industry experts scoffed at the notion that Bush, himself an oil millionaire, will curb profits raked in by his Texas oil buddies. It now looms over the Nov. 7 elections, with panicked Republicans distancing themselves from the oil-soaked Bush-Cheney regime. He was referring to the notorious White House Energy Policy Task Force, which authored an energy bill that lavishes $170 billion in taxpayer subsidies on big oil and gas corporations over the next decade while giving them a green light to jack up gas prices. The Republican-majority House and Senate approved it and Bush signed it last Aug. 8. House Minority Leader Nancy Pelosi (D-Calif.) said, “We have two oilmen in the White House. The logical follow-up from that is $3-a-gallon gasoline.” She blasted the GOP for blocking an increase in the minimum wage while working people struggled last winter to pay for home heating oil. Exxon Mobil reported $10 billion in profits for the first quarter of this year. Company CEO Lee R. Raymond recently retired with a pension totaling $400 million. Raymond earned $686 million over the years 1993-2005, or $144,573 each day. Last year Exxon reported $36 billion in profits, likely this year to exceed $40 billion if the Bush administration and Congress permit the swindling to continue. “These oil companies are like Jesse James, not wanting to admit they’ve robbed a bank,” Hamilton said. “There can be no more compelling evidence that the price gouging and market manipulation which has produced record oil prices is out of control,” Dorgan said. Big Oil is running full-page ads shifting blame to OPEC, Hurricane Katrina, or hard-pressed service station owners who net about 6 cents from each gallon of gas they sell. Back in 2000, Big Oil emptied their storage tanks in the Midwest, exporting 280 million gallons overseas to drive gasoline prices as high as $2.50 per gallon. Hamilton wrote a report exposing it. Global Exchange, a San Francisco-based peace and environmental group, called for a boycott of Exxon Mobil. “Purchase gas at Citgo, whose profits are being used to improve the lives of the people of Venezuela,” the group urged. The Sierra Club, the Wilderness Society and other environmental groups called for a boycott of Exxon Mobil last July to protest the corporation’s sabotage of the Kyoto Accord on reduction of greenhouse emissions.